Credit Simple - See your credit score and credit report for free. See your credit score instantly - it's free, forever. Get targeted offers and insights based on your profile. Credit file monitoring means you’ll receive periodic email alerts when certain changes occur on your credit file. Free access to Money Simple, the new tool to help you track your money. 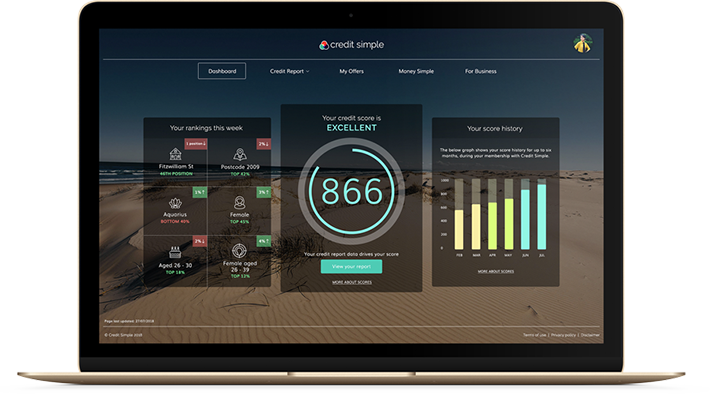 See your business credit score, risk profile and credit information for free with Credit Simple for Business. Tools and tips to help you understand your score and take the next step towards financial freedom. We'll give you your credit score and credit info, and show you how your credit score compares by age, gender and community. You'll also be able to access insights on what it all means, plus targeted deals - such as credit cards and loans. It takes just one minute to sign up, and it's free - now and forever. Our systems are independently tested and audited by external security experts, and your data is encrypted using industry best practices. Already registered? Login hereHaven't registered? Please confirm you're not a robot first.